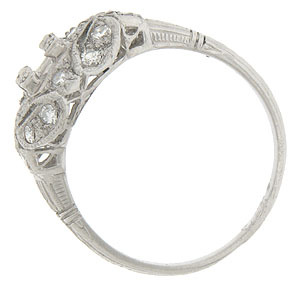 This sparkling platinum antique style engagement ring mounting will hold a .35 carat round stone. 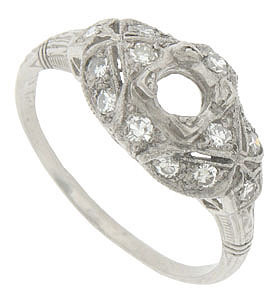 The floral inspired wedding ring is embellished with a scalloped filigree and set with an additional .35 carat total weight round faceted diamonds. 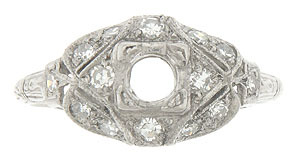 The sides and edges of the band are covered with delicate engraving. The ring measures 9.20 mm in width. Size 6 3/4. We can re-size or reorder in other sizes. Also available in 14K or 18K yellow and white gold or platinum. Actual cost depends on current market value of the precious metal used.